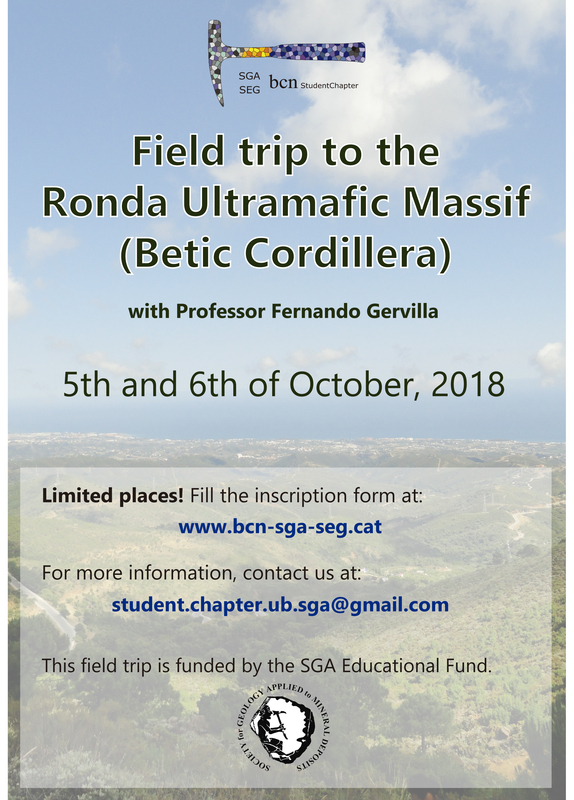 We would like to invite you to take part in the field trip organized by the Barcelona SGA-SEG Student Chapter to Ronda Ultramafic Massif (Betic Cordillera), with Professor Fernando Gervilla, from the University of Granada. The field trip will take place the 5th and 6th of October 2018. During these days we will be visiting the western part of the Ronda Massif to see the peridotitic section of an ophiolite and the associated magmatic ores. The accommodation will be in Estepona (Malaga, Spain). Participants are expected to arrive to Estepona the day before, 4th of October, so we can leave to the field all together from there the day after. Transportation to the field and lunch (picnic) expenses will be covered by the Barcelona SGA-SEG Student Chapter, thanks to the SGA Educational Fund. The accommodation and travel expenses to Estepona will not be covered. Further details on how to arrive to Estepona from Malaga airport and accommodation in Estepona will be given later. Please, contact us for any question.